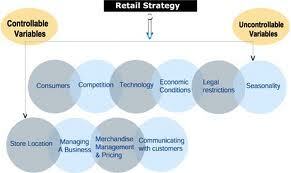 Retail Strategy can be a marketing plan that details how a business intends to offer its goods to consumers and influence their buying. For example, a typical full price strategy might illustrate how better to place and present a company’s products in shops and how to get optimal consumer attention at those locations with particular things like price discounts, placement, retailer incentives etc. The leading purpose of the report is to learn the part of retailing procedure for department/such other forms of stores. The other reason for this report is analyze the way to develop retailing business that used to complete an organization’s objectives. It also handled the retailing procedures used and role of retailers from the distribution channels, how they increase the benefit of products to the consumers.